The way most of the QR Code Readers work is when a QR code that contains a URL is scanned by the user the reader will show the URL and only if the user confirms, will load it. In relation to the nature of the tracking (and of the URL shortening services) the generated URLs will look like http://t.azon.biz/ABCD. This URL does not contain any hint as to what is in the site, what is the content related to, who is the owner. Even worse - it can lead to a malicious site and because of this concern and the many unknowns your clients may not open the site at all. 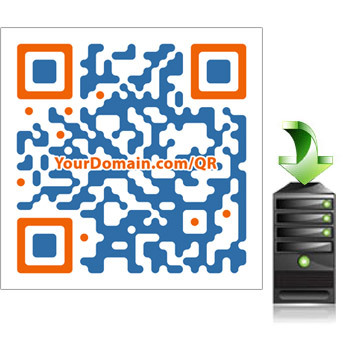 Consider instead the following URL: http://yourdomain/product-promotion-qr - now it is a much more clear what is the company/brand and what is the QR code linked to. Using our Self Hosted Tracking we provide you with the ability to enable the QR Codes to display your domain/brand and the relevant info and in the same time utilize our powerful tracking platform. The Self Hosted Tracking has one more major advantage - you do not rely on an external system for your campaign. Even if our tracking system goes down your campaign will not be affected in any way - the content will continue to be served and the hits saved. When the tracking system goes up it will retrieve all data and the statistics will become available even for the period while the system was down. The Self Hosted QR Codes are also Dynamic QR Codes - you can have different content in the same way you can have for the tracked codes. The Self Hosted Tracking is available as an option to our Agency and Enterprise packages. To find out more information about the Self Hosted Tracking please read the FAQ. If you would like to have this option enabled for your account please contact us.